alaTest has collected and analyzed 5113 reviews of Asus Transformer Book T100TA. The average rating for this product is 3.9/5, compared to an average rating of 4.3/5 for other products in the same category for all reviews. Reviewers are impressed by the battery and price. The portability and performance are also mentioned favorably. Many are less positive about the apps and connectivity. There are some mixed comments about the camera. We analyzed user and expert ratings, product age and more factors. Compared to other products in the same category the Asus Transformer Book T100TA is awarded an overall alaScore™ of 89/100 = Very good quality. 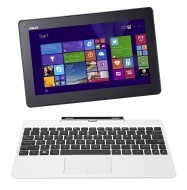 alaTest has collected and analyzed 323 user reviews of Asus Transformer Book T100TA from Amazon.co.uk. The average user rating for this product is 3.7/5, compared to an average user rating of 4.3/5 for other products in the same category on Amazon.co.uk. Reviewers really like the durability and price. The usability and performance are also mentioned favorably, but many are less positive about the reliability. 76% of the reviews on Amazon.co.uk give this product a positive rating. alaTest has collected and analyzed 1491 user reviews of Asus Transformer Book T100TA from Amazon.com. The average user rating for this product is 3.7/5, compared to an average user rating of 4.1/5 for other products in the same category on Amazon.com. Opinions about the screen and portability are overall positive. The battery and performance also get good feedback, but many are negative about the apps and connectivity. alaTest has collected and analyzed 56 user reviews of Asus Transformer Book T100TA from Amazon.ca. The average user rating for this product is 4.1/5, compared to an average user rating of 4.2/5 for other products in the same category on Amazon.ca. 86% of the reviews on Amazon.ca give this product a positive rating. Good IPS panels are becoming more frequently used in budget devices. The Transformer Book T100T is one of the most significant products of the year. We look forward to other vendors' response. I removed Windows and installed Ubuntu with ease. Ubuntu is running stable, with support for all hardware except camera (so far). Was able to delete ugly Windows and install Linux with ease. Tablet plus keyboard makes typing easier. Charger seems to take way too long to charge the battery.